The State Department will close a number of U.S. embassies and consulates on Sunday due to "more than the usual chatter" about a potential terrorist threat. A senior U.S. official said that although the threat does not have a great deal of specificity about time and location, it is being taken "very seriously." U.S. "interests" including military installations could also see additional security and protection measures. The official, and a second official as well, noted that tensions are rising with the approach of both the holy days at the end of Ramadan and the first anniversary of the September 11 attack on the U.S. compound in Benghazi, Libya. Several hundred Marines in Spain, Italy and in the Red Sea could provide additional security for U.S. embassies in southern Europe, North Africa or the Middle East if requested by the State Department. State Department spokeswoman Marie Harf revealed the closings but gave no details as to the locations of the affected embassies or the nature of the threat. "The Department of State has instructed certain U.S. embassies and consulates to remain closed or to suspend operations on Sunday, August 4. The department has been apprised of information that out of an abundance of caution and care for our employees and others who may be visiting our installation, that indicates we should institute these precautionary steps. The department, when conditions warrant, takes steps like this to balance our continued operations with security and safety," Harf said. The US is looking to end drone strikes in Pakistan, Secretary of State John Kerry said Thursday. Kerry told a Pakistani television station that President Barack Obama has "very real timeline". "We hope it's going to be very very soon," according to a transcript of the interview provided by the State Department. "I believe that we're on a good track. I think the program will end as we have eliminated most of the threat and continue to eliminate it," Kerry said. He added that the cessation depends on "a number of factors" and the US is working with the Pakistani government. After ramping up strikes in the tribal region in the first few years of Obama's presidency, the number of drone strikes in Pakistan has dropped significantly, in part due to the deterioration of al Qaeda in the country and more focus on threats from al Qaeda groups in other countries like Yemen. Iran would be willing to sit down for direct talks with the United States, the country's ambassador to the United Nations said in an interview broadcast on CNN. "I can confirm it here with you, and also for your distinguished audience, that Iran will come negotiation and direct talks with the United States provided that we make sure that U.S. is serious and do not act differently," Ambassador Mohammad Khazaee told CNN's Fareed Zakaria in an interview that aired on Fareed Zakaria GPS. Khazaee said Iranians felt that at last week's negotiation with the United States and other aligned nations, "both sides are getting closer to each other." 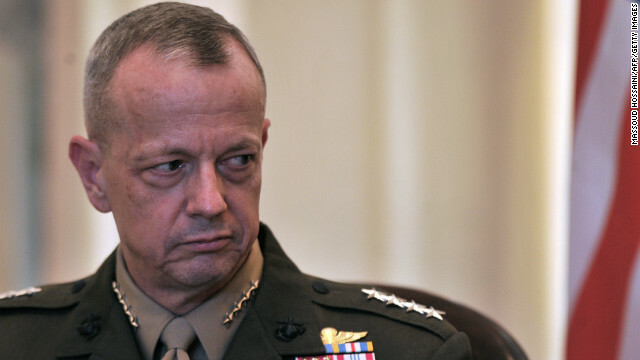 Gen. John Allen informed the president he will retire rather than move forward with the nomination to become the supreme allied commander of NATO, the White House announced Tuesday. The president accepted the resignation, according to a statement from the president (see below). Allen was the commander of U.S. forces in Afghanistan for nearly two years. But he was caught up in a scandal over embarrassing e-mails with Tampa socialite Jill Kelley that came to the public's attention during the same investigation that brought down former CIA Director David Petraeus. After several months, Allen was cleared of wrongdoing, and the White House initially indicated that President Barack Obama would proceed with the nomination. Allen informed some of his staff he was considering the retirement, CNN's Chris Lawrence reported last week. The White House knocked down a proposal last summer from top national security leaders, including then-Secretary of State Hillary Clinton and CIA Director David Petraeus, to arm Syrian rebels, according to U.S. officials, one of whom said the issue appears dead for now. 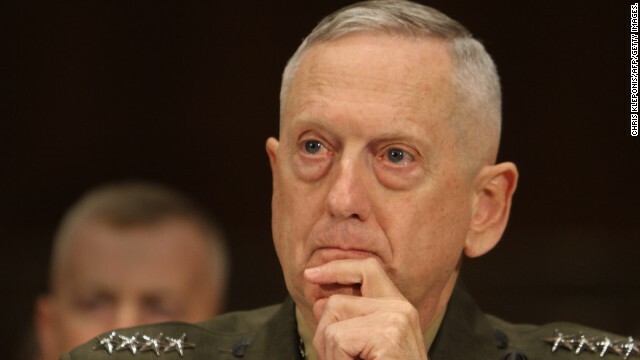 Defense Secretary Leon Panetta and Joint Chiefs Chairman Martin Dempsey said in testimony to a Senate committee on Thursday that they also backed the plan to provide weapons to opposition fighters. But officials, who requested anonymity to speak freely about a sensitive subject, said the White House rejected the idea. "The reason we have not armed them is because the White House has no appetite for it," a U.S. official familiar with the deliberations told CNN. The official said the ambassador to Syria, Robert Ford, was among those in the State Department who "advocated for it pretty strongly." The issue of arming the rebels "is dead in the water for now because folks are resigned to the fact that White House will not budge," the official added. The Obama administration has resisted arming the rebels, citing concerns about the infiltration of extremists groups who could possibly use those weapons against other targets. The United States has signed a deal with the central African nation of Niger to host American troops and surveillance drones to keep tabs on Islamic militants in the region, officials from those countries said Tuesday. Pentagon spokesman George Little said the role of U.S. troops in Niger "has not yet been defined" - but Niger's ambassador to the United States, Maman Sidikou, told CNN that his government has agreed to let U.S. drones operate from its territory. Sidikou says his understanding of the agreement is the drones will be unarmed and used for surveillance to monitor extremist movements. He refused to discuss where in the country the drones would be based or when they will be operational. France: "We are winning in Mali"
Niger lies to the east of Mali, where French troops and warplanes are fighting alongside government troops to push back Islamist fighters who seized much of the former French colony in 2012. The U.S. ambassador to Syria says the Syrian regime is slowly starting to crumble. 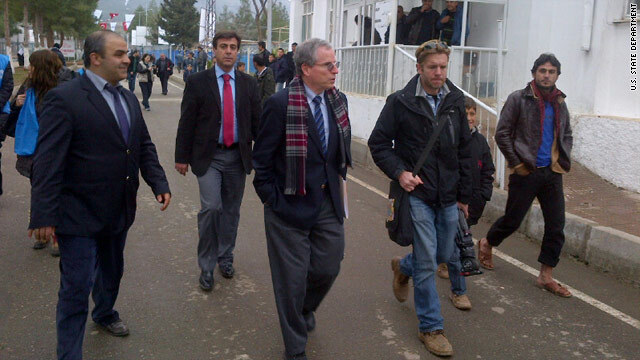 Ambassador Robert Ford said in an exclusive interview with CNN's Ivan Watson while touring the Islahiye refugee camp in Turkey that it is a slow process, but the signs are pointing toward decline. "Members of the regime, little by little, are flaking off," Ford said, noting that Syrian President Bashar al-Assad's mother had fled the country and is now in the United Arab Emirates. Ford said it is a slow process, but al-Assad’s government is falling apart. "You can see, little by little, the inner core is weakening," Ford said. "But again, it's a gradual process." Ford said when the U.N. envoy Lakhdar Brahimi met with al-Assad in December, the closeness of the fighting was evident. "He told us that you could hear artillery outside the president's office," Ford told Watson. "The fighting is getting that close now to the inner circle itself. And so you can imagine what that does to their own spirits, their own morale." The United States military could provide logistical and intelligence support in the French effort against Islamist rebels in Mali, Defense Secretary Leon Panetta said Monday. The U.S. will "provide whatever assistance it can" as part of what Panetta said was the U.S. global efforts against al Qaeda. "We have a responsibility to go after Al Qaida wherever they are. And we've gone after them in the FATA. We're going after them in Yemen and Somalia. And we have a responsibility to make sure that Al Qaida does not establish a base for operations in North Africa and Mali," Panetta told reporters traveling with him to Europe.